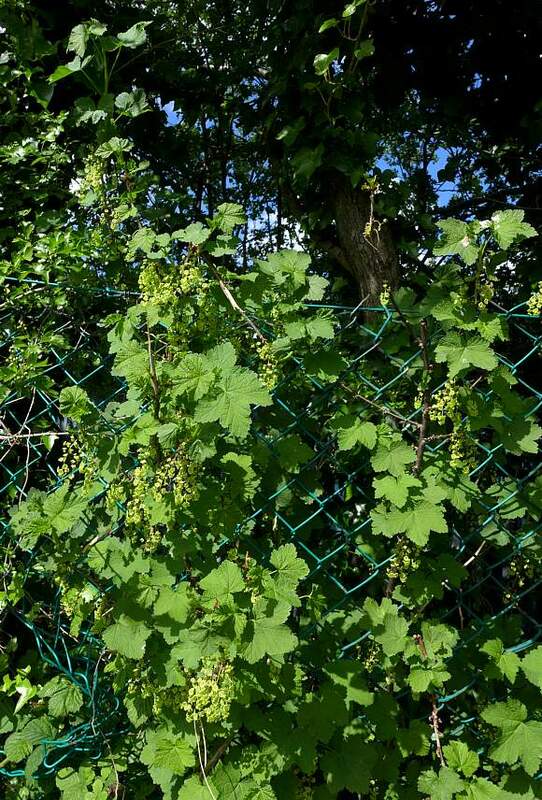 It is not a climber, but here using a diamond-grid fence upon which to grow, just like the Ivy either side of it. Has pendant flowers in racemes (rather than panicles). Leaves vary in size from 3 to 10cm and are either hairless or sparsely hairy, the smaller ones are oval to cardioid in shape. The larger leaves with 3 to 5 lobes. All are irregularly but bluntly toothed. Racemes with spaced out flowers with 3-10 flowers/berries on a raceme 4-8cm long. Older stems glossy brown (right). Flowers shallowly bowl-shaped with 5 rolled over creamy-green sepals. These are NOT the petals, which are far shorter and within the bowl. 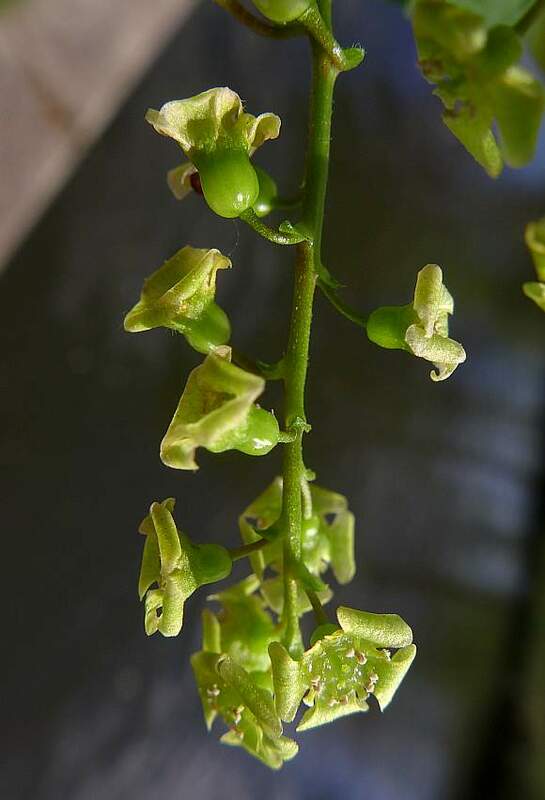 Flowers on short petioles (stalks) emerging from a short triangular bract. 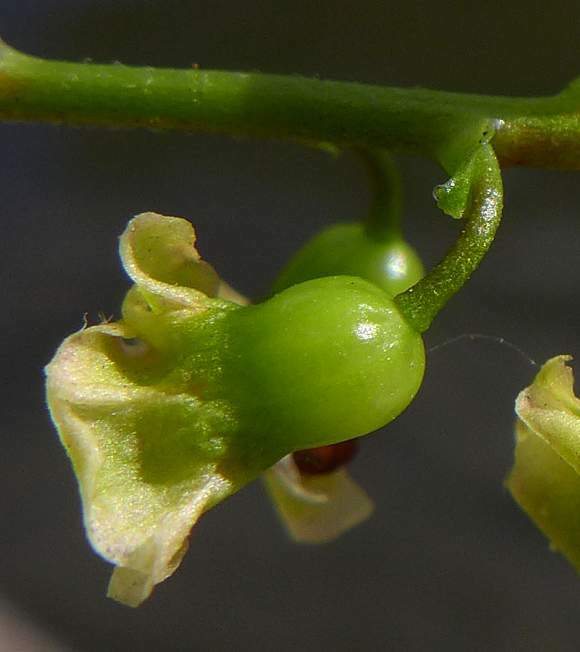 The sepal-tube is bulbous, hairless and shiny-green. It splits into 5 rolled-over creamy-green sepals. 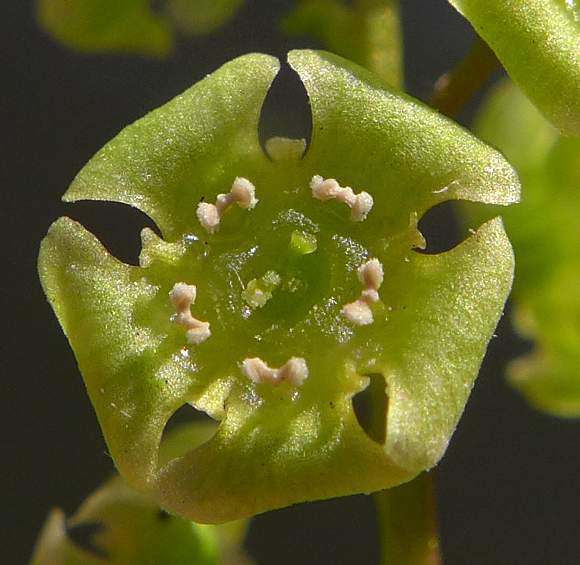 Bract from which the flower stalk (with short hairs) emerges and in a short distance joins onto the hairless shiny-green sepal tube which splits into 5 creamy sepals. 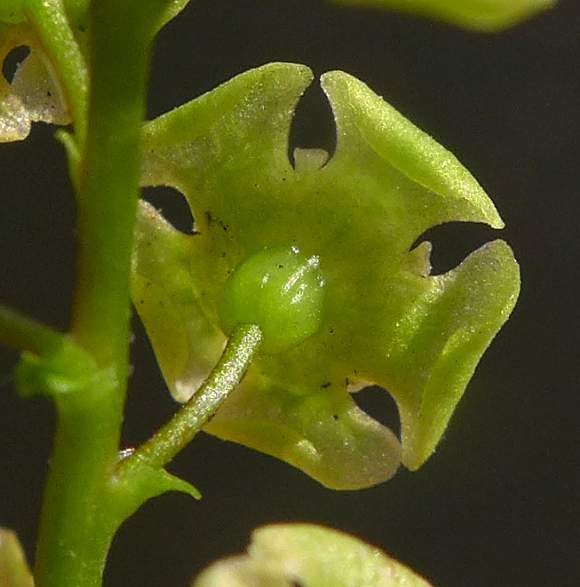 The sepal tube merges into 5 sepals which widen and roll over. In-between the sepals are 5 short very narrow petals on the other side, you can just see some of them from the rear of the flower. 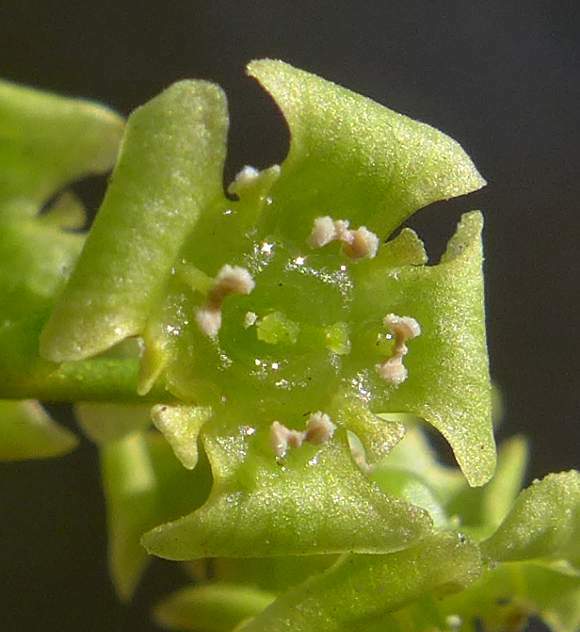 From the top of the flower the 5 very short, narrow, creamy-green coloured petals can be seen between the much longer and wider sepals. 5 dumbbell cream-coloured anthers emerge between the petals. There are 2 pale-green styles in the central crater. The flowers are 4-6mm across and look like the negative terminal of a PP9 battery. 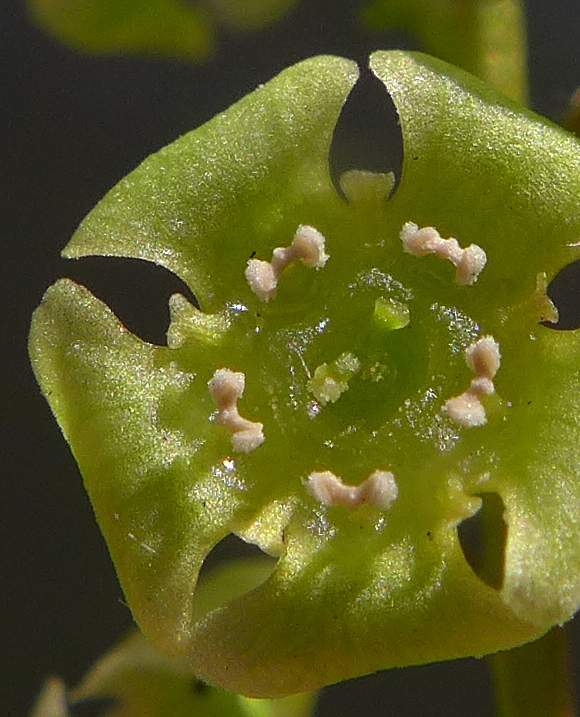 This specimen has abnormally but 4 sepals but it does have the usual complement of 5 petals, 5 anthers and 2 styles. The petals have 2 lobes at the termination of their minuscule length. 5 Dumbbell cream-coloured anthers and 2 green styles in close-up. 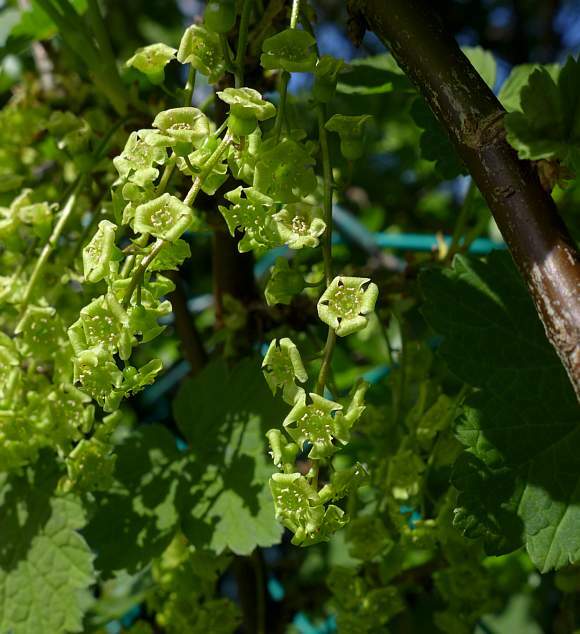 Distinguishing Feature : The shape and colour of the flowers, see photos. No relation to : Current [the flow of electrons due to a voltage gradient]. The flower does possess petals, but they are much shorter than the shallow-bowl shaped sepals and therefore not so obvious at all. 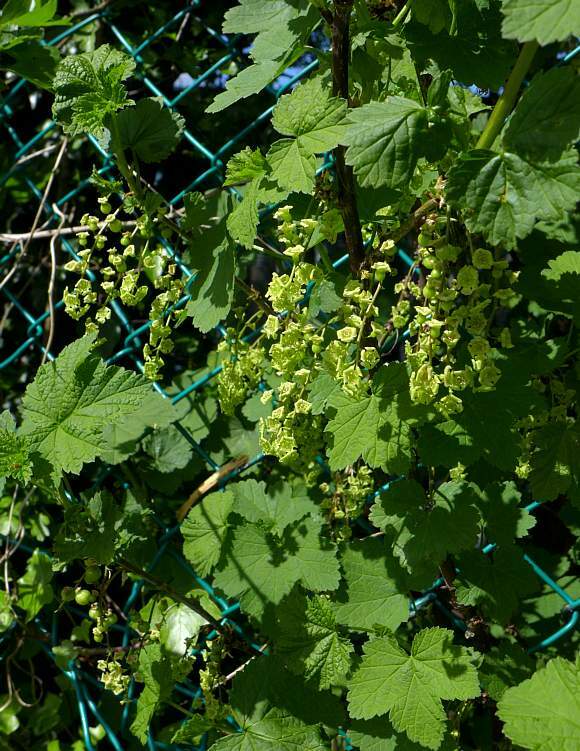 It grows in woods, hedges, scrub and escapes from gardens up to 2m high but usually just 1-1.5m. It is thought to be native. The berry, which is edible, is 6-10mm across and usually bright shiny translucent-red when ripe (only rarely is it white). It grows throughout the British Isles although is rare in a great many places. 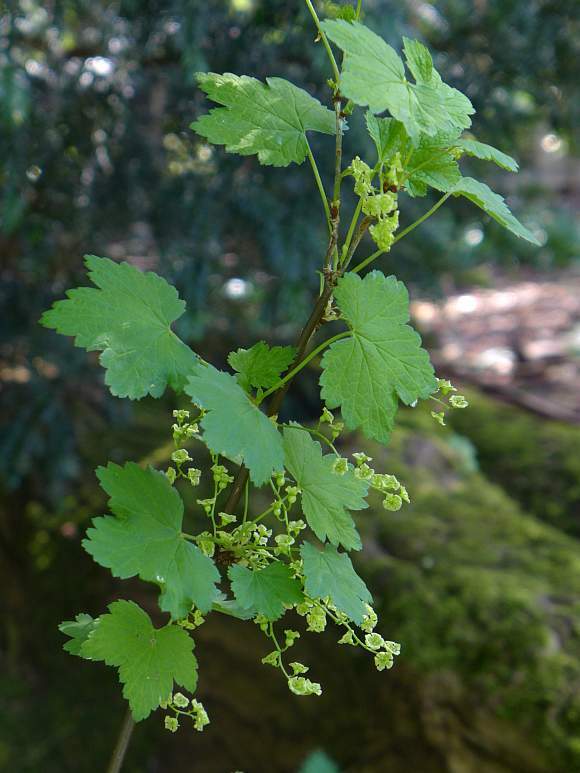 Several differing species of Currant were once widely cultivated across Europe and the cooler northerly parts of America. 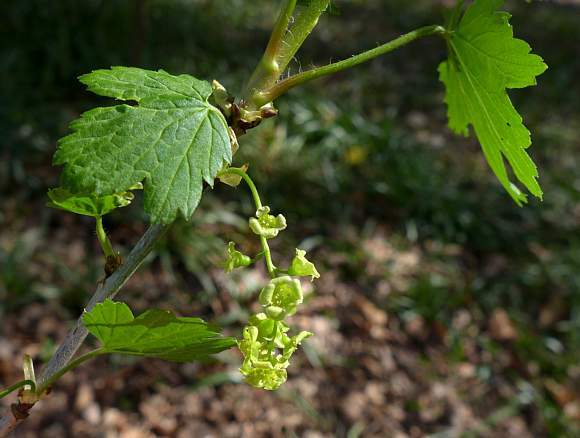 Occasionally the berry of the Red Currant is white and is marketed as 'White Currant', a botanical variety of Red Current (not a differing species). White berries are sweeter than the Red berries. The red berries of Red Currant are slightly more tart than the berries of Black Current (Ribes nigrum). Redcurrant jelly (essentially a jam) is often served with lamb or other meats in a Sunday Roast dinner. The juice of the berries contains 25 astringent compounds with very long chemical names, such as two carboxymethyl-indole glucopyranosides, several HydroxyBenzoyloxyMethyl-GlucoPyranosyloxy ButeneNitriles, and two GlucoPyranosylPhenylHex(e/a)nones - one called Rubrumin the other DehydroRubrumin , named after Ribes rubrum, but your Author has not been able to find their chemical structural formulae.